This statistic shows the percentage of U.S. adults aged 18 years or older with IBD who smoked from 2015-2016. 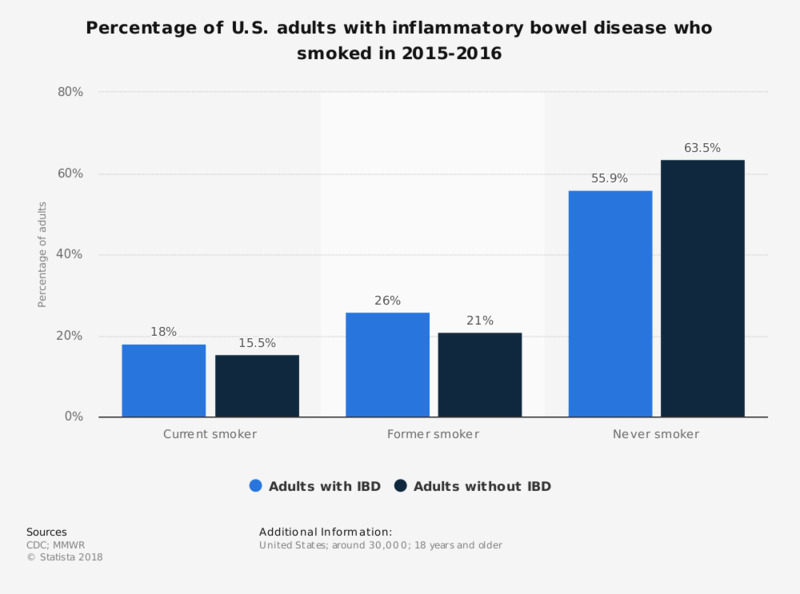 According to the data, among adults with IBD, approximately 18 percent were current smokers, compared to just 15.5 percent of adults without IBD. Cigarette smoking status was defined as current, former, or never smoker. Current smokers reported having smoked ≥100 cigarettes in their lifetime and currently smoking cigarettes some days or every day. Former smokers reported having smoked ≥100 cigarettes in their lifetime but were not current smokers at the time of the survey. Never smokers reported they had not smoked ≥100 cigarettes in their lifetime.